My Home and Garden: Moving the cranberry already. 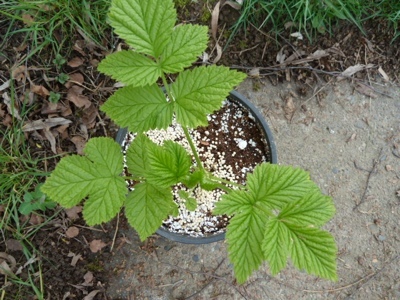 A lovely potted Fall Gold Raspberry for my sister. Moving the cranberry already. A lovely potted Fall Gold Raspberry for my sister. Last month I planted a cranberry right beside the greenhouse door. I realized within three weeks that the placement was a mistake. I have a large patch of snowberries in that area. I was watching as all the new snowberry shoots were coming up all around the cranberry. It would eventually be swallowed up by the snowberries. I grabbed the freshly planted cranberry, now drenched from the pouring rain, wiggled it until it came loose. I planted it in one of the raised beds, at least for now. I dug out the nice big juicy Fall Gold Raspberry runner that is outside the area allocated for best growth of a raspberry. I am impressed that in one season it has roamed so far. Last year I lost all of my raspberries in that bed. I give 100% credit to the alpaca manure. I dug up the fattest runner and planted it in a one gallon pot for my sister Jess. She has a terrace that is south facing and super hot in the summer. I mean super hot. I will be giving her two tomato plants and a pepper or two. They should do super well there. Where is your sister going to plant that Raspberry? If she has only a terrace, it may be a challenge to find the right conditions. Raspberries do best in cool moist conditions. As you have already found out, they also like room to roam! Her terrace wraps from the east to south. I have honestly never seen plants do so well. I will have her put it far into the east side. Her terrace is super hot, so it may not work. It'll be fun to see if it works. It'll stay in a pot and she has drip irrigation.